Situated in Okotoks, Alberta, Canada at a latitude of 51°N, the Drake Landing Solar Community (DLSC) is claimed to be the first major use of high temperature seasonal borehole thermal energy storage in North America. 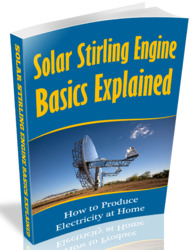 The energy comes from an active indirect solar water heating system using flat plate solar collectors which harvest enough energy to provide 90% of the annual space heating and 60% of DHW needs for the 52 individual dwellings on the site, even throughout long winters where temperatures can plummet to -33°C. The project was conceived by Natural Resources Canada, a Canadian federal government department, as a show-case environmentally friendly residential community, and carried out in partnership with local developers, equipment suppliers, local authorities and other government departments. 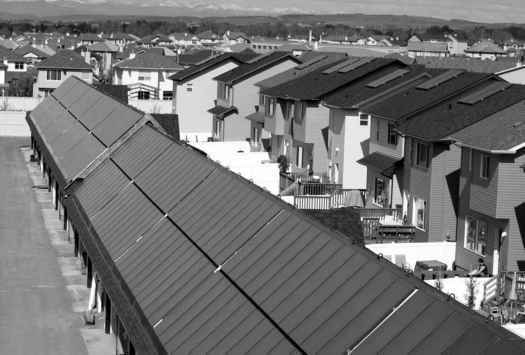 Solar energy for space heating is captured by an array of 798 collectors totalling 2,293 m2 mounted on the detached garages. The community is more than 1,000 m above sea level, but peak summertime temperatures average more than 20°C, so the collectors, facing due South at an angle of 45°, can generate 1.5 MW of heat energy on a typical summer's day. (The tilt angle is latitude -6°, showing a slight bias towards summertime efficiency.) Solar energy is transferred to a glycol solution, which passes down to an underground pipe network and thence to a heat exchanger inside a high temperature short-term thermal store (STTS) in the project's 'Energy Centre'. Two unpressurised 120 m3 epoxy lined cylindrical steel water tanks form the STTS. Internal baffles encourage stratification. The Energy Centre also houses most of the pumps and controls. When, as is frequently the case during the summer, the temperature in the STTS exceeds that in the BTES, pumps cut in, and hot water from the STTS is circulated through the boreholes. In summer the collectors heat up the STTS about twice as fast as the BTES can absorb heat from the SSTS, so the BTES pump has to run most of the night to maintain a balance. them, layers of sand and insulation are protected by a waterproof membrane, topped by clay and landscaping. The store is made up of 24 strings of six boreholes in series, divided into four circuits and distributed through four quadrants so that the loss of any single string or circuit will have minimal impact on storage capacity. By the end of a typical summer, temperature in the earth surrounding the boreholes is expected to top 80°C. A power cut on a sunny summer's day could cause serious problems with overheating of the glycol loop. To insure against this possibility, a 3.6 kW solar PV array is mounted on the roof of the Energy Centre, backed up by a 27kWH battery bank and inverters inside the control room. This set-up provides enough power to run the primary collector loop pumps; during normal operation the power from the array supplements mains supplies and keeps the batteries fully charged. During winter nights when the glycol is not circulating, parts of the loop can cool down to below freezing. When the collectors start operating on a sunny winter's day, the glycol solution is diverted through a bypass loop until its temperature is greater than the water at the top of the STTS to protect the glycol to water heat exchanger in the STTS from freezing. exchanger to the district heating loop. This supplies heated water at 50°C or less on demand to individual houses - space heating is accomplished by a specially designed low temperature air handler unit in the basement, inside which the hot water passes through a water to air heat exchanger. Warmed air is distributed through the house via internal ductwork. If the stored water temperature is insufficient to meet the current heating load, natural gas-fired boilers raise the temperature of the district loop as required. 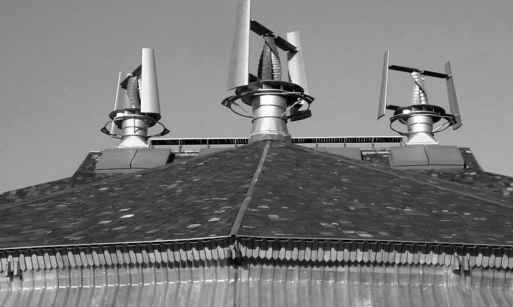 Two independent solar collectors on each house roof supply DHW, backed up with a high-efficiency gas-fired water heater. The Canadian low-flow solar DHW system is designed to provide about 60% of the annual hot water load. Currently, space heating and DHW in a typical newly built Canadian home consumes around 125 GJ of natural gas each year, with 80% used for space heating, and 20% for DHW. Another 30 GJ is needed for lighting, appliances and the like. This all produces around 7 t of greenhouses gases each year. The target is to reduce the use of natural gas at Drake Landing by nearly 94 GJ on space heating and 17 GJ on water heating. Overall, this represents a saving on each of the 52 houses in the DLSC of at least 5 t of greenhouse gases annually, a reduction of more than 70%. A significant contribution to these savings comes from the design of the houses themselves, which feature upgraded insulation, high-performance windows and heat recovery ventilation. Solar energy began to flow into the BTES in June 2007, but it was estimated it would take at least three years to fully charge it and reach 80°C by the end of each summer. 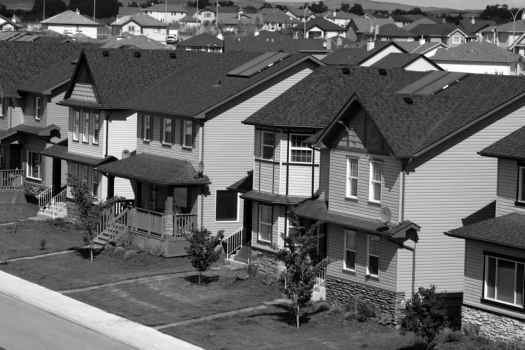 Construction of the 52 homes is complete, and all homeowners had moved in by September 2007. Early performance results indicate that the solar energy system is performing as expected and that the 90% solar fraction will be achieved by year 5. Energy centre building and system construction: Hurst Construction Management Thermal storage design: IFTech International.